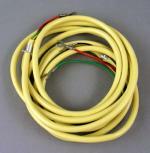 Yellow vinyl covered 7' line cord that can be used in the restoration of many different types of classic telephones. Has 4 conductors on each end. Original round 6 conductor yellow line cord. Perfect for your yellow plastic telephones. Western Electric desktop yellow rotary dial Trimline telephone.